Velodyne SPL-1000 Ultra review | What Hi-Fi? The chase for ever smaller subwoofers that produce increasing amounts of bass shows no sign of slowing. Velodyne’s SPL-1000 Ultra could never be described as cheap, but it delivers a mass of bass scarcely creditable from a (sealed) cabinet that is essentially, just a 34cm cube. The sturdy forward-firing 25cm driver helps, of course, as does an internal class D amplifier rated at 1.2kW power output. This Velodyne is a well-specified subwoofer. It has both line and speaker level inputs, remote control and offers four preset modes to optimise performance to the source material. The presets make a notable difference to the sound, so it’s well worth playing around with these when you first set everything up with your system. It’s also worth taking a little time to equalise the subwoofer for its position in the room. At the press of the EQ button, the SPL-1000 Ultra will emit 12 sweep tones (covering the frequency range from 20Hz to 150Hz) and use an internal seven-band equaliser to even out the sound. the heavy-hitting and truly large-scale battles of Avatar. This Velodyne continues to impress even when pushed particularly hard, managing to deliver high volumes with waves of deep bass as well as any rival we’ve heard at this level. It all points to a solid cabinet build alongside a heavily engineered drive unit and amplification. 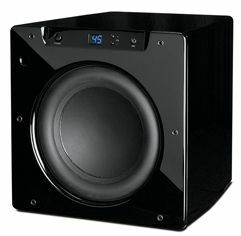 To sum up, then, this is another really excellent bass speaker from the subwoofer specialist Velodyne. It cannot quite match the perennial class leader, B&W’s outstanding PV1, in either outright precision or engineering innovation. But it does offer chunkier, more authoritative bass. And, to many, that will be a more than fair trade.